I’ve got another book review today featuring Homebrew Beyond the Basics by Mike Karnowski. 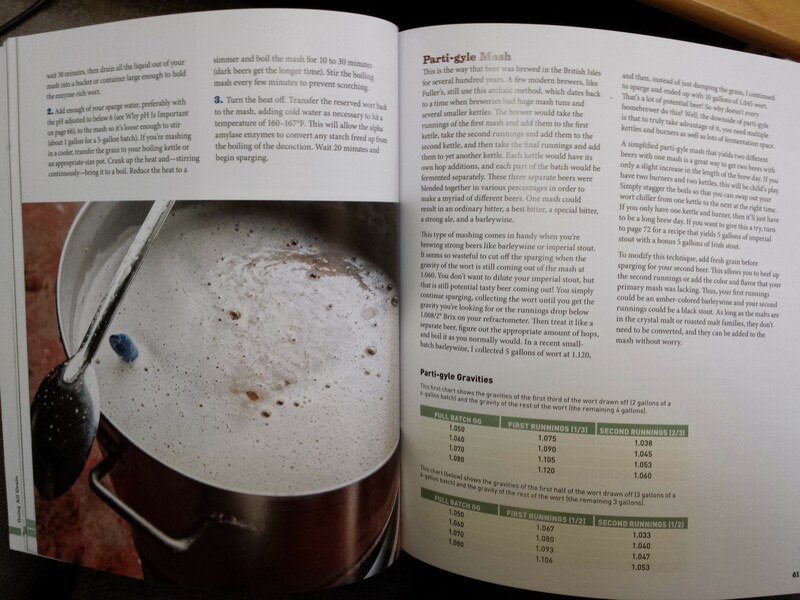 This may seem like just another homebrewing book but this one is written by an actual brewer. Mike is the head brewer at Green Man brewery in North Carolina. Also unlike many homebrewing books this one is just about advanced all-grain setups skipping past the extract section. Karnowski leads us through advanced homebrewing techniques from making a simple beer using all-grain instead of malt extract up to barrel aging and souring. He does this is a simple easy to understand format with plenty of pictures along the way. For each aspect of homebrewing he supplies one of his own recipes that highlights the subject at hand. So you’re not only reading and learning about these things but you can actually experience them and begin to know them. Beyond general instruction the Homebrew Beyond the Basics can work as a handy reference on a variety of items. The author includes descriptions of all various types of malts broken down by their level of roast. Later in the book is a large selection of hops with information on the alpha acids, flavors, and uses for those hops. This trend continues to include yeasts most helpfully adding in the exact number of that yeast strain from both Wyeast and White Labs so you can make sure you pick up the right strain to go with the recipe. Karnowski goes beyond just including information on malt, hops, and yeast and adds info on various types of wood used in barrels, staves, cubes, or chips. Continuing this advanced trend he ends the book with all manner of fruits and various forms of them with what styles of beer they’re best in. The downside is that there are a lot of pictures, very pretty pictures mind you, of glasses of beer which re not helpful instructional photos. It seems that many pages have a half to full-size photo spread on the opposite page. Sure, this isn’t bad per se, but it is frivolous and makes the book larger than needed. As I’ve said many times the author provides plenty of “general” info that will do an excellent job of pointing you down the advanced homebrewing road. However, the book lacks much in-depth info and this could be disappointing luckily Karnowski does point you to more thorough resources to continue your learning with. If you’re thinking of moving from extract to all-grain, or getting into brewing and blowing past the all-grain stage, than this book may be a good resource for you. Personally, I would point you to more straight-forward in-depth books that will serve you better for a longer period of time. In the end though the best resource is always your local homebrew supply shop. Go up there and brew a batch with the guys/gals. They’ll know what you need to know, they’ll have the supplies you forgot to get in advance (I always forget at least 1 thing), and if you want to try something fancy they will likely have gear you can borrow for that batch. If you’re looking for a gift for your beer brewing buddy than this would make a good present. Almost any level of homebrewer will enjoy and learn something from this book and at the very least it would make a nice coffee table book for them. I’ve had a reference book in “Designing Great Beers” which I love, but is incredibly dense and without photos. A few sprinkled here or there – even if kind of pointless – would be a welcome addition! I do love nerdy books like this one, however, especially if it’s got a good amount of in-depth info to simply read over and digest. Is it more reference or would it be good for flipping through for fun, too? I would say it’d be good to flip through. You’d definitely get some interesting ideas for new beers to try, especially in the sour and wood aging sections.